Canada. World Philosophy Day. Seminar at New Acropolis Toronto (Canada). Canada. World Philosophy Day. A day organized by New Acropolis Montreal (Canada) in the Cirque Eloize building. A question and answer session on philosophical themes with participants. Guatemala. World Philosophy Day. Promotional activity by members of New Acropolis Guatemala. Honduras. World Philosophy Day. Exhibit of philosophical caricatures and sentences by members of New Acropolis in a shopping center in Tegucigalpa (Honduras). El Salvador. New Acropolis presents a folk dance at the Marte Museum of San Salvador (El Salvador) for World Philosophy Day. El Salvador. Images to Reflect On. Photography contest for World Philosophy Day. Exhibit in a shopping center in San Salvador (El Salvador). El Salvador. World Philosophy Day. 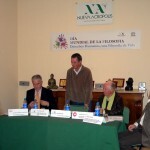 Presentation of New Acropolis’s cultural activities in El Salvador. El Salvador. Environment and Values. A New Acropolis activity in El Salvador for World Philosophy Day. El Salvador. Images to Reflect On. Winners of the photography contest organized by New Acropolis El Salvador for World Philosophy Day. Slovakia. World Philosophy Day. Lecture and exhibit on New Acropolis’s activities at the Zichy Cultural Palace in Bratislava. Slovenia. World Philosophy Day. Interview with the Director of New Acropolis on Slovenian national television. Ukraine. World Philosophy day. Philosophical contest in libraries and schools organized by New Acropolis volunteers. Brazil North. World Philosophy Day. Three days of celebrations at New Acropolis Brasilia with debates, talks, theater and themed expositions. More then 100 volunteers welcomed more then 750 participants. Brazil North. World Philosophy Day. 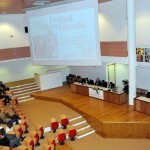 Three days of celebrations at New Acropolis Brasilia with debates, talks, theater and themed expositions. 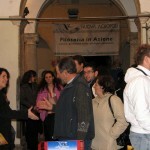 More then 100 volunteers welcomed over 750 participants. Chile. World Philosophy Day. Diffusion in downtown Puerto Montt (Chile) by New Acropolis representatives. Peru. Searching for Sophia. Searching for the Meaning of Life. Exhibit at New Acropolis Lima for World Philosophy Day. Peru. The Philosophy of the Warrior and the Meaning of Life. Lecture at New Acropolis Lima as part of a series for World Philosophy Day. Peru. The Philosophy of the Warrior and the Meaning of Life. Interview on Peruvian National Radio by Professor Ricardo López Raygada on the series of lectures offered by New Acropolis. Germany. The Path of Happiness. Lecture on Socrates’ teachings given by New Acropolis Germany for World Philosophy Day. Belgium. Dialogue between science and spirituality. 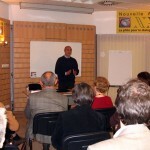 Lecture to mark World Philosophy Day by Professor Fernand Figares, Director of New Acropolis Belgium. Spain. 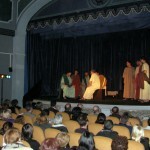 Staging of “The Death of Socrates” by New Acropolis at the Barcelona Athenaeum for World Philosophy Day. Spain. Philosophy news. Talk at the Barcelona Athenaeum with the participation of the director of New Acropolis Barcelona. Spain. World Philosophy Day. 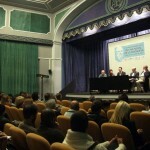 The Director of New Acropolis Cadiz participates in a round table on the Universal Declaration of Human Rights. Spain. 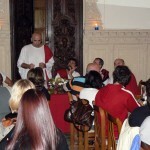 Staging of Plato’s work The Banquet at New Acropolis Grenada for World Philosophy Day. Italy. 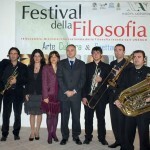 Wind instrument quintet concert during the Philosophy Festival organized by New Acropolis Syracuse. Italy. Voyage on the Seas of Friendship. 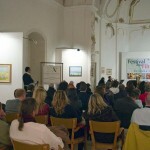 New Acropolis L’Aquila (Italy) organized an activity in an old palace for World Philosophy Day. Italy. Youth. Nihilists or Idealists? Philosophical studies seminar organized by New Acropolis Catania (Italy) for World Philosophy Day.